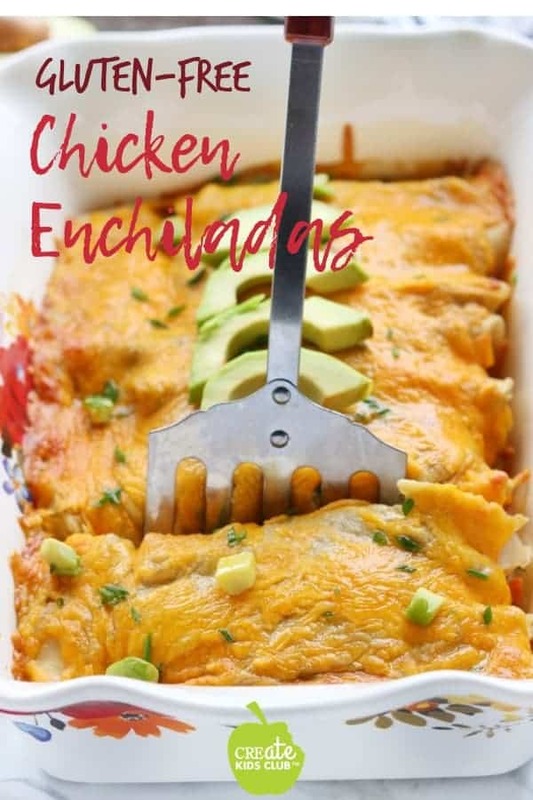 This gluten-free cheesy Chicken Enchilada recipe is a healthy dinner recipe that’s simple to make and tastes amazing. A simple healthy family meal that the whole family will love. 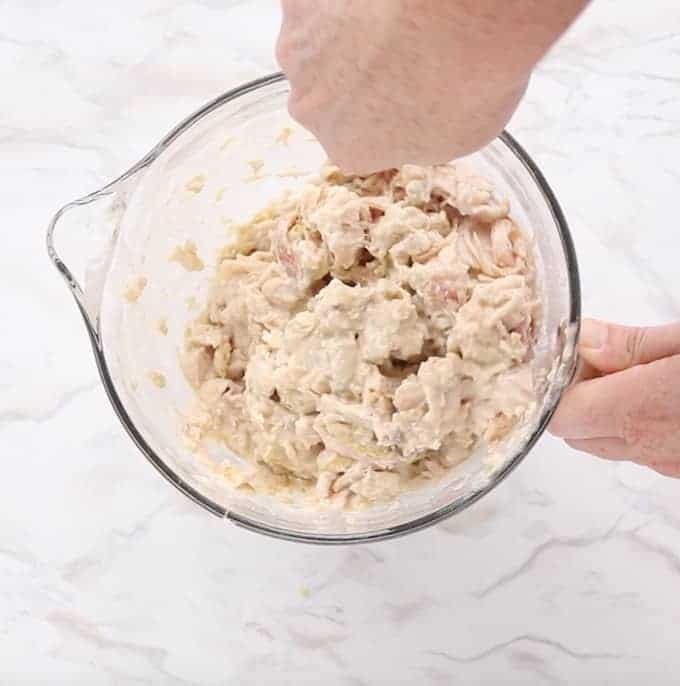 This recipe works great with leftover chicken, canned chicken, leftover turkey, or rotisserie chicken works great too. Can Creamy Chicken Enchiladas Be Make Ahead of Time? For sure! You can make them the night before for a delicious warm healthy family dinner that just needs to be baked after getting home. This family dinner recipe uses corn tortillas which my kids don’t like for tacos. However, they do like them in this recipe so you might want to try them to see what your family thinks. 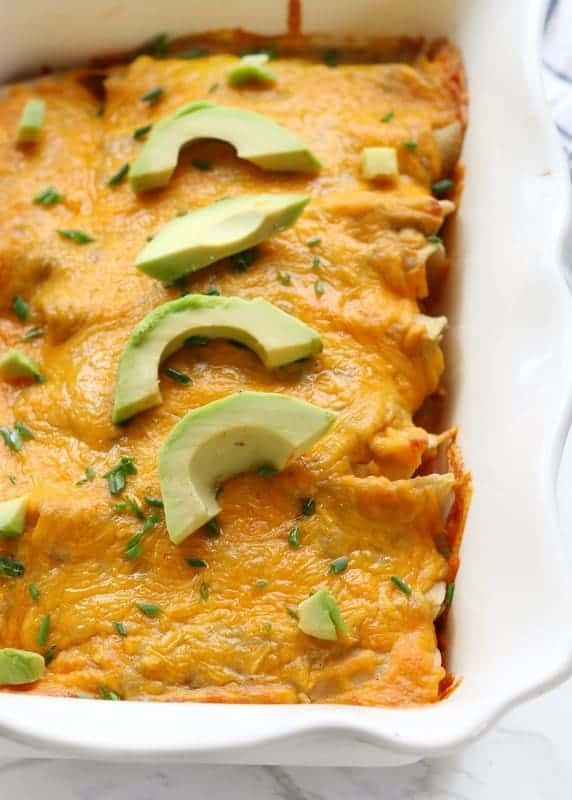 Are Creamy Chicken Enchiladas Healthy? This recipe is! Using Greek yogurt rather than sour cream helps cut fat and calories. The shredded chicken is lean meat, and the cheese is cut back when compared to other enchilada recipes. The flavor of this recipe shines through with the use of green enchilada sauce, green chilies, and spices. If you’re looking for more healthy dinner recipes, my families favorites include Crockpot Potato Soup, Baked Chicken Thighs, Baked Spaghetti, Veggie Buddha Bowls, and Mexican Quinoa Chicken Casserole. These chicken enchiladas come together quickly, even though there are a few steps to follow. Let’s walk through step by step how to make them so your family can enjoy them as much as mine. Place half of the sautéed onions into a medium-sized mixing bowl, leaving the other half in saute pan. To saute pan, add enchilada sauce, Greek yogurt, half of the cheese, cumin, and salt. Stir well. In a medium-sized mixing bowl with sautéed onions, combine cream cheese, green chilies, beans, and garlic powder. Mash, then stir in chicken. 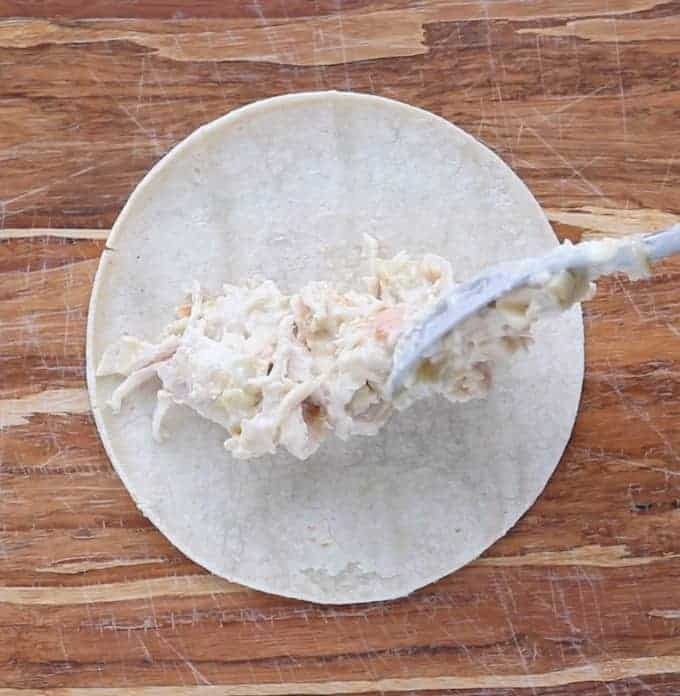 Spoon chicken mixture onto corn tortilla, roll up, and place in prepared pan. Pour on sauce and sprinkle with remaining cheese. Keep reading for written step by step instructions or watch the video to see how smoothly this recipe comes together. 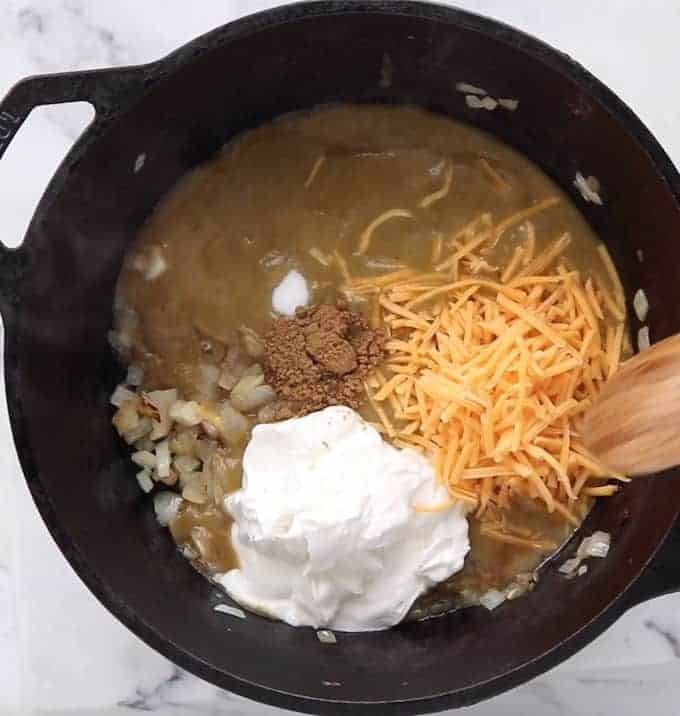 This recipe begins by making the creamy green sauce that will end up being drizzled on top of the enchiladas before they head to the oven. First, saute an onion in a little olive oil and cook until translucent. Remove about half of the onions, placing them into a medium-sized bowl. You’ll use these onions inside the chicken enchilada. Kitchen Tip: If you’re feeling lazy and don’t want to separate the onions, they can all go into the sauce, no worries! Add the green (or red) enchilada sauce, greek yogurt, shredded cheese, and spices. 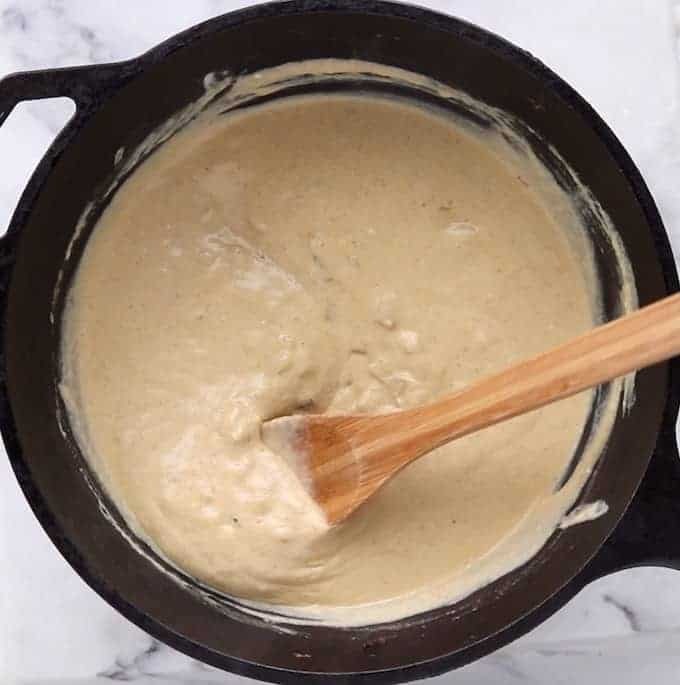 Mix until the cheese is completely melted into the sauce. You might want to try a test taste to make sure it’s properly seasoned, and because it’s delicious. 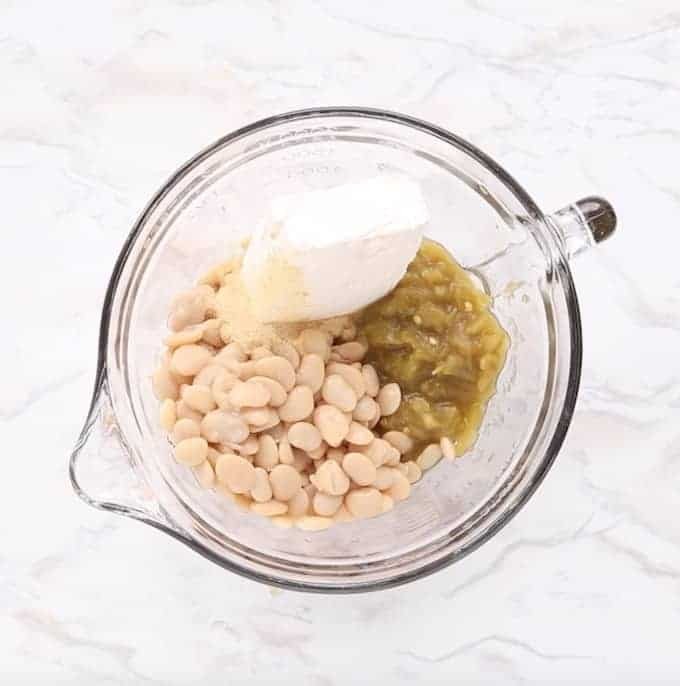 To the bowl with the onions, add white beans (whatever variety you prefer), green chilies, cream cheese, and spices. Use a potato masher or a fork to mash it all together. 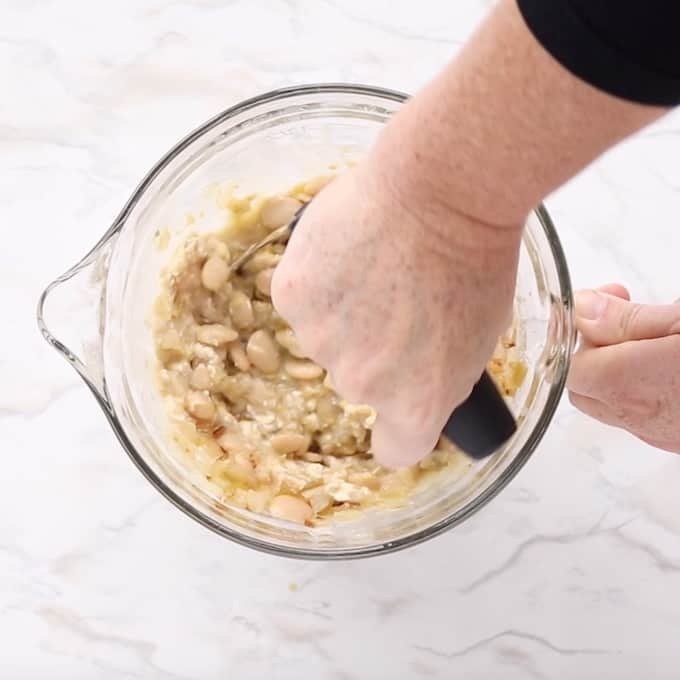 You could just stir it together, but I like to mash the beans so they are less noticeable (helps with those kiddos who may not love beans yet!). Stir in chicken. You can use rotisserie chicken or leftover chicken. I buy the Costco rotisserie chicken in the bags then divide that into individual ziplock bags and freeze it so I always have leftover chicken on hand. Works great! For gluten-free enchiladas use corn tortillas. My family does not love corn tortillas, but they do like them in this recipe. You can always swap them out for flour tortillas if desired! 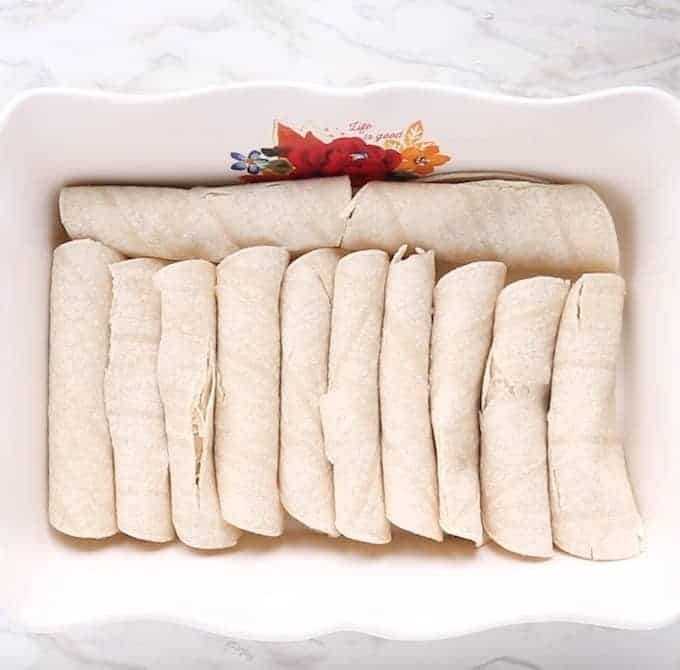 Roll up all enchiladas until you use all the mixture. Place them into a baking pan sprayed with non-stick cooking spray. 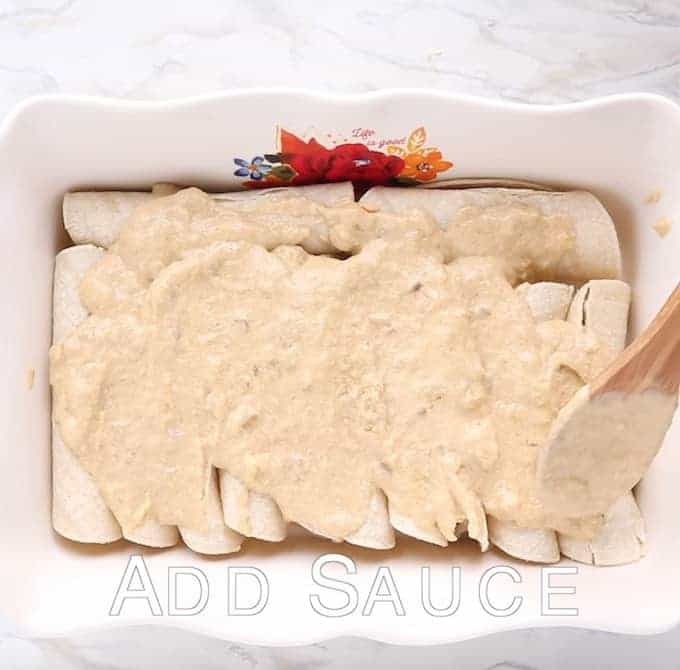 Drizzle the creamy green enchilada sauce you made in the first step on top of the rolled up enchiladas. Top with shredded cheese and bake for 30 minutes or until golden brown. Serve right away. Topping suggestions: Top with sliced avocado, green onion, black olives, or tomatoes for delicious flavor and a pop of color. 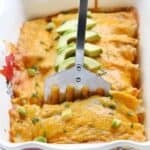 Can Creamy Chicken Enchiladas Be Frozen? Yes! You can freeze the whole recipe prior to baking, after baking, or as leftovers. 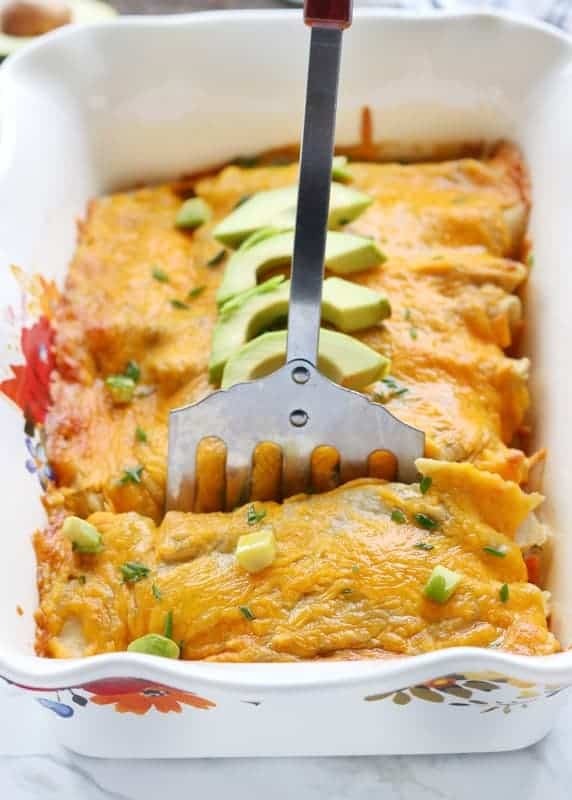 If you are freezing leftovers, place the chicken enchiladas into an individually sized microwave save container. To reheat you can microwave the enchilada, or for a higher quality end product, reheat using the oven or a toaster oven. Chicken enchiladas can be just as good the second day if you reheat them properly. 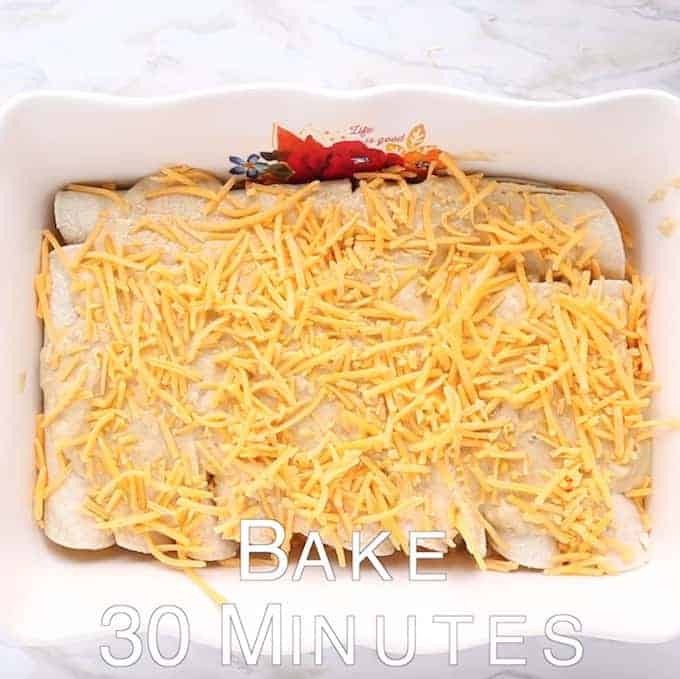 The best method is to reheat them in your oven set to 350 degrees for about 20-30 minutes or until the enchiladas are warmed through. You can reheat enchiladas in the microwave as well, they just won’t be as crisp as they get in the oven. I have reheated this recipe in the microwave and put it into a warm thermos for my kid’s lunchbox and they love it (even though it doesn’t look to pretty!). I like to serve this dish by attempting to cut across the pan finding the individual enchilada shells. Sometimes it works, other times it doesn’t, but it doesn’t really matter, You could cut it into squares if you’d like too. I like to serve chicken enchiladas with Crockpot Refried Beans and a side salad. A creamy chicken enchilada recipe made with rotisserie chicken, Greek yogurt, green chilies, great northern beans, and green enchilada sauce, this is a must try gluten-free recipe! The perfect healthy family meal. Prepare a 9 x 13 inch pan with non-stick cooking spray. To saute pan, add enchilada sauce, Greek yogurt, half of the cheese, cumin, and salt. Over low heat, whisk until well blended and cheese is melted. Do not boil. In a medium-sized mixing bowl with sautéed onions, combine cream cheese, green chilies, beans, and garlic powder. Mash with potato masher or fork until well blended. Sprinkle with remaining ½ cup shredded cheese. Bake for 30 minutes, until the cheese is melted and sauce is bubbly. I am sad we are in the cold season of comfort food, but you are so right that this recipe fits the bill! YES! to more cooking at home! Let’s encourage this more with all our folks in 2017! And the recipe itself looks amazing! For sure Mandy! 2017 = Year of the return to the kitchen 🙂 Love it! This looks like the perfect meal everyone in my family would LOVE! Do you know the nutritional info on this? Hi Lauren! I don’t have the nutritional information at this time, but I am looking into reliable software for this purpose. In the past I found the calculations of some programs to be quite off so I shut this feature off. Check back at a later date and I hope to have this feature up and running! Thanks so much for reaching out! Hi Elizabeth! Thank you so much for pointing out this missing step! In my retyping of the recipe, I totally missed it. You are correct that the enchilada sauce, yogurt, and half of the cheese get added to the sauce pan, the cooked over low heat to melt the cheese. I appreciate you reaching out and I hope you love the recipe as much as I do! We’ve made this recipe several times. It’s so good!